I hope you all enjoyed your Thanksgiving yesterday. I had a nice, relaxing time with family. I'm now focusing on holiday knitting, so I've been thinking a lot about accessory projects that will knit up quickly. I'm reminded of the Budding Forest Cowl that was published not too long ago by one of my favorite yarn companies—Quince & Co. This past Spring—as the forest began coming back to life, as flowers bloomed, and baby leaves were born—this cowl was imagined. The combination of stitch patterns reminds me of what I saw as I watched the forest bloom. While in Spring, the weather is becoming warmer, I thought a cowl would be a great use of this stitch pattern to remind us throughout the chilly Autumn and Winter that come springtime, the forest will bloom again. It's knitted using 3 hanks of their ultra soft and bouncy yarn, Lark. 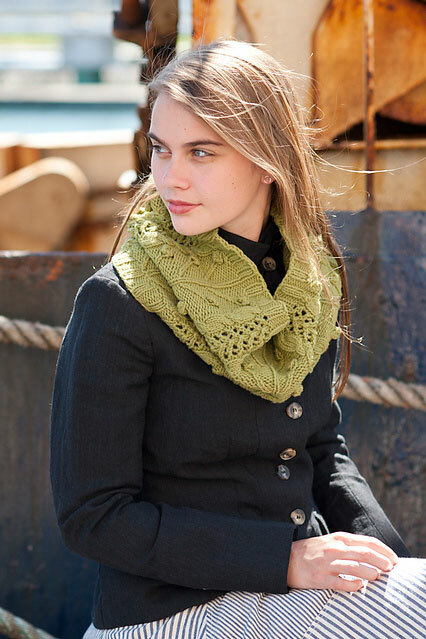 There's a little lace, and a few cables, and even some bobbles to top it off. It's like an ice cream sundae. 32 sts (1 patt rep) = 6¾" (17 cm) and 24 rnds (2 patt reps) = 3½" (9 cm) in budding forest pattern, after blocking.